Warning: The combination of sweet, spicy, and salty in this cheese ball makes it addictive. 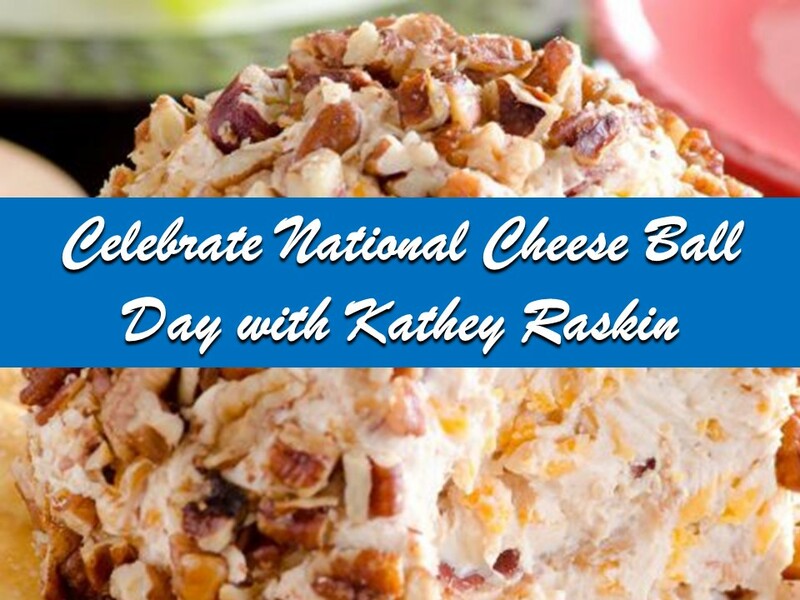 Are you ready to celebrate National Cheese Ball Day with me, Kathey Raskin of Las Vegas? It’s only two days away! The cheese ball is a cocktail party classic, and your guests won’t soon forget this new twist on an old favorite— the Spicy Candied Pecan and Bacon Cheese Ball. The secret here is in the cheese. Combining medium sharp cheddar and cream cheese takes the edge off the hot sauce, while the candied nuts deliciously contrast it. Mix the cream cheese and cheddar cheese until smooth and creamy, then blend in the hot sauce and salt. After covering your countertop with plastic wrap, scrape the mixture onto the plastic, wrap the plastic around it, and mold into a round ball. You’ll want to refrigerate this for a minimum of one hour. Next, toast the candied pecans in a 350 degree oven for approximately 8 minutes, stirring once or twice and taking care not to burn the nuts. After they’ve cooled, mix the crushed pecans with the diced bacon in a pie dish. Take the cheese ball out of the refrigerator and unwrap it, place it in the pie dish, and lift and press it until the entire surface is covered with the nut and bacon mixture. Set your cheese ball on a serving plate and serve with your favorite crackers. I like Ritz the best! This Spicy Candied Pecan and Bacon Cheese Ball can be prepared a day in advance, and it will last two days in the refrigerator, though I recommend you eat it quickly or the bacon could get soggy. Trust me, eating the whole thing quickly will not be a problem! I recommend you do not freeze your cheese ball. The secret to this delicious cheese ball is Mexican cheese! Three festive cheese ball recipes to make when you want eye-catching, colorful appetizers.